Nikki Haley, the tough-talking and blunt US Ambassador to the UN, was heckled during an annual summit on women here as she spoke about President Donald Trump and Russia. Haley was speaking 4 April at the 'Women In The World' summit, a premier annual gathering of influential women leaders, politicians and activists organised by media personality Tina Brown in association with the New York Times. 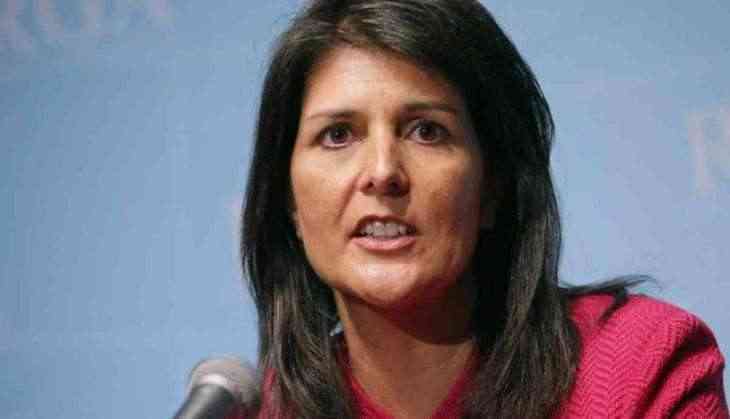 As she was answering questions during the session titled 'Trump's Diplomat: Nikki Haley' moderated by MSNBC anchor Greta Van Susteren, Haley was booed and heckled on several occasions. At one point someone in the audience shouted "what about refugees" while another said "when is the next panel." During the nearly 22 minute session, a woman in the audience shouted "when is the next panel," to which the 45-year-old smiled and exclaimed "wow" as the audience tried to shush the heckler. She was heckled again when asked how America deals with some of the world leaders who are dictators. "You call them out when they do something wrong and you work with them when you can find ways to work with them." As some members of the audience shouted at her remarks, Haley said "we have to express America's values. We are always the moral conscience of the world," to which someone from the audience shouted "what about the refugees", cutting off Haley. Haley went silent. Van Susteren paused, and then said, "Moving on." At the end of the day's programme, Brown commended Haley for attending the event even as she got a "boisterous reception" and for remaining gracious as she was heckled. "We often complain and sneer and say Republicans never want to come on any kind of forum except Fox News or places where they can be asked questions that are soft," Brown said, adding that Haley did not put on any pre-conditions and sat very "graciously" while the audience heckled. "She didn't get agitated about it, and she's in the middle of a lot of world crises. So I feel that we should really applaud the fact that she did come." Van Susteren asked Haley why the world has not heard much from Trump about Russia, a question that drew a thunderous applause from the audience. Haley said, "first of all keep in mind that I work for the Trump administration," a response that generated boos and heckles from the audience and prompted Van Susteren to ask the audience to "hold on, hold on. We got to get people fix these problems." Haley added that she has "hit Russia over the head more times than I can count. It's because if they do something wrong we are going to call them out on it. If they want to help us defeat terrorism, fine." "But the things they have done with Crimea and Ukraine, the things they have done with how they have covered up for (Syrian President Bashar) Assad, we are not going to give them a pass on." Haley said she has had conversations with Trump "where he very much sees Russia as a problem and I think if you look at his actions, everybody wants to hear his words but look at his actions. The two things that Russia does not want to see the US do is strengthen the military and expand energy and the President has done both of those." She gave out a smile as her comments again drew prolonged boos from the audience. On the chemical weapons attack on a Syrian town, Haley said Russia blamed it on a container of chemical weapons that ISIS had. "There is no ounce of proof. They just make things up," she said. Haley, earlier this year, scripted history by becoming the first-ever Indian-American to be appointed to a cabinet-level post in any US administration.